The southernmost segment of Interstate 785 follows the eastern leg of the Greensboro Northern Loop (I-840). I-785 was signed along the Greensboro beltway north from I-40 and I-85 to U.S. 70 in December 2016. The loop opened north from there to U.S. 29 on April 19, 2018. When the Greensboro Northern Loop is completed west from I-785 and U.S. 29 to U.S. 220 (Battleground Road) in 2020, Interstate 840 will be fully signed along side I-785. The concurrency will represent only the second occurrence of two branch routes combining along a single stretch of freeway within the Interstate Highway System. The first instance is where Interstates 271 and 480 overlap east of Cleveland. Future plans extend Interstate 785 northeast from Greensboro along U.S. 29 to Reidsville and Danville, Virginia. 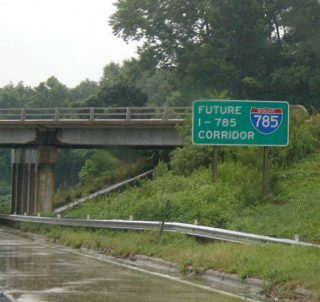 North of Greensboro, I-785 exists solely on paper with the exception of a few future Interstate 785 corridor guide signs. This is due to upgrades required to bring the U.S. 29 freeway to Interstate standards. This includes adding or widening existing shoulders, building acceleration and deceleration ramps, and other improvements. Interstate 785 in its entirety is part of High Priority Corridor 17 and 40: Route 29 Corridor. One of two Future Interstate 785 corridor signs posted along the U.S. 29 expressway northbound. This assembly stands within the trumpet interchange at U.S. 29 Business south of Reidsville. Photo taken by Steve Vetter (07/02). The establishment of Interstate 785 from I-85 in Greensboro, North Carolina, north along the U.S. 29 freeway to the interchange with U.S. 58 in Danville, Virginia, was approved by AASHTO on November 14, 1997. I-785 subsequently appeared on North Carolina’s Strategic Highway Corridors map by November 12, 2004. The designation was eventually approved by FHWA on July 31, 2013 and by AASHTO on October 21, 2013. 2000s construction in Danville brought the section of U.S. 29 there to Interstate standards. Interstate 785 ends in northeast Greensboro where the Greensboro Northern Loop meets U.S. 29. Interstate 785 ties into the exchange where the I-40/85 overlap west from Durham and Burlington concludes. I-85 runs along the southeastern quadrant of the Greensboro Outer Loop to I-73. North Carolina Department of Transportation Strategic Highway Planning Documents.